UKIP won only their second seat in the House of Commons on Thursday in the eagerly anticipated dreaded Rochester & Strood by-election. With Nigel Farage’s party polling at approximately 15%, there is a genuine fear that the purple party can win a healthy number of seats next May. The prominence of ‘acceptable’ xenophobia seems to be rising with UKIP incessantly upping the ante of their anti-EU agenda and to great effect. With the ascension of UKIP has come an ugly change to the two larger parties. In a frankly thinly veiled effort to win back support, both Labour and the Conservatives have championed a new approach to immigration policy in order to soothe the concerns of the electorate and tempt defected voters back on side. This week, Labour pledged to increase the deferral on immigrants claiming benefits for up to two years whilst the Conservatives have been branded ‘BNP-lite’. In essence, Nigel Farage may finally have a point, it appears Miliband and Cameron are hiding in the shadows from UKIP, but who exactly is speaking out for the 85% that aren’t worried by nefarious immigration scapegoating and the endless propaganda that aims to portray the EU in the same light as Emperor Palpatine’s galactic empire? Last week, BBC’s Question Time took the bold approach of affording yet more time to discussing the issues of the ‘UKIP-ification of Lab-Con’, the NHS and UKIP themselves. One of the panellists, Yasmin Alibhai-Brown declared that no party had stood up to UKIP, which simply isn’t true. One party had stood up to UKIP a long time ago, but that party is still in the electorate’s bad books over a tuition fees clanger in 2010. The Liberal Democrats are not suddenly shouting anti-immigration and anti-EU rhetoric from the rooftops in the face of UKIP’s rise. In fact, the party has stuck to its principles, ironically given the party’s recent reputation for doing the opposite. Only Nick Clegg challenged Nigel Farage to a debate on the EU and immigration, Ed Milliband weaseled out of one as recently as a week ago. The Liberal Democrats were the only party of ‘in’ during May’s European elections, a bold strategy given the relentless tide of Europhobia in the right-wing press. Just what is this obsession with immigrants anyway? Studies have shown that immigration benefits the crown jewel of British politics, the National Health Service and has contributed £25billion to the British tax fund in recent years. Why are we talking about this so much when benefit thieves are more likely to be British, just as the tax evaders who are bigger burdens on the nation’s economy. Why are we not discussing this in as great a depth? Too, the Lib Dems are having to battle a dogged tide of populism heading in to next May’s General Election. Given the tuition fee debacle, the party’s unrivalled efforts to challenge UKIP’s deceitful campaigning has largely fallen on deaf ears. Of course, nowadays we’re all expected to humour and indeed hate the Liberal Democrats, having failed to deliver the abolition of tuition fees and then raising them in line with the Conservatives ideals instead. Truthfully, that decision was a major blow to the party’s plans in governments, whilst it allowed them to deliver other policies such as equal marriage and a higher income tax threshold, it did alienate student voters – and understandably so. Of course, the reason the policy couldn’t be enacted was the stubborn opposition from the Tories and Labour, meaning only a majority for the Lib Dems in May would have been enough to realise the policy. Of course, the Lib Dems have made the issue of repayment far easier than under Labour, who bizarrely seem to be winning support from students themselves. As it were, the policy was undeliverable and Nick Clegg was forced to apologise for a policy he would have only been able to implement with 326 seats – but the party are still being battered in the polls, largely because of this slight misbehaviour. Did the Conservatives apologise for U-turns of reorganisation of the NHS or cuts to public spending? Have Labour apologised for abandoning ‘moral politics’ and launching a new initiative against migrants? So then, why are views like Yasmin Alibhai-Brown’s in that we ‘don’t trust the Lib Dems’ but trust Labour and the Tories so common? Is it really fair that the Lib Dems have taken such a hammering compared to the rest of the ‘establishment’? Will the Greens face the some blockade of disdain when they find that free higher education is undeliverable for the mean time too? The answer to the last two is probably not. The widespread concern for UKIP’s place in the General Election next year is fair and founded. Nigel Farage’s ‘army’ is increasingly sounding like the self-professed ‘racist’ British National Party – in fact, a clip of Chris Huhne’s reaction to Nick Griffin’s policy on Question Time, a few years ago seems to mirror many of UKIP’s stances now. Their dubious morals are constantly under scrutiny and in truth detailing the never-ending list of the party’s gaffes would be tiring and depressing, especially as it never seems to dampen support. It’s time we as a righteous, moralistic electorate put UKIP to the sword like the Liberal Democrats have been for months. As Brian Paddick put it on Twitter; if you hate what UKIP and now Labour and the Conservatives stand for, then it’s time to reconsider voting Liberal Democrat. Currently, there’s a widespread feeling of confusion at Filbert Way. After an impressive haul of eight points against Arsenal, Everton, Chelsea, Stoke and Manchester United, the Foxes have failed to pick up more than a solitary point against less fancied outfits Crystal Palace, Burnley, Newcastle, Swansea and West Brom – as well as high-flying Southampton. 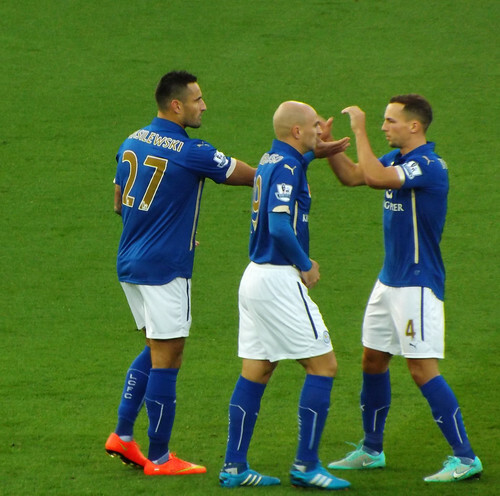 Begging the question; what on earth has happened to Leicester City? I’m not usually a fan of phrases like “typical Leicester” or “classic City”. They’re constantly used with pessimistic connotations and are synonymous with the sort of banally arrogant fatalism that’s spouted by nearly every football fan the nation over. However, Leicester’s recent glitch does seem to resonate with our rather regrettable tradition of helping those on a bad run – be they Newcastle, Swansea or Shane Long. At least, that’s all I thought it was until one point in four became one point in five which then became one point in six. Last season, Leicester were a beacon of stability. The formidable system of 4-4-2 was seldom tinkered with, and the same could be said for the personnel. Crucially, it seemed the Championship’s big-hitters of last term; Leicester, Burnley, Derby etc., all used the fewest amount of players in the league. Consistency in selection led to consistent results. I’m sure monotony, as you may dub it, is quite in tune with City manager Nigel Pearson’s appearance. However, in recent weeks he seems to have deviated from that image. Leicester have started their last six games in no less than five different systems with the starting eleven from the previous game failing to survive intact for the next game once. And as much as I admire his work at the club thus far, Nigel Pearson ought to take a sizeable portion of the culpability for the recent blip. The manager’s defensive and dismissive attitude when it comes to discussing tactics with the media has been challenged lately as he’s been keener to explore different set-ups – it appears Pearson may have bought in to the anti-4-4-2 rhetoric of the Premier League’s experts. Persistent tinkering is surely counter-productive, particularly when that very tinkering has the side lining up to match West Bromwich Albion’s threat at home. Talks of a confidence crisis have been rife on City forums, and with the manager not placing ample faith in his side to undo Albion playing to their strengths there would be no surprise if there was some substance to it. There too have been repeated calls of a reversion to Leicester’s favoured 4-4-2 system, to include more width in to the side’s play, be it tactically en vogue or not. City’s strikers that started the most recent league outing at St. Mary’s, Leonardo Ulloa and Jamie Vardy have scored six goals between them this season, all of them, bar a penalty against Manchester United have come from wide positions. In fact, since Pearson sacrificed width for whatever he feels the side has gained since, I can barely remember the pair having a shot on target between them. On top of this, the Foxes seem content enough to continually invite pressure on themselves away from home, looking to absorb any threat and then cannon the ball back out to the opposition – at least we appear to have learned the art of defending set pieces, not that we could score one at the other end in a month of Sundays. Simply put though, Leicester are not good enough to play the containing game away from home and consistently pick up points. Our best players are attackers, and as clichéd as it sounds, they need to be a form of defence for us away from home as much as the defenders do. Don’t get me wrong, Nigel Pearson has been a superb manager for the club and to want his dismissal at this moment in time would be lunacy but his decisions of late have definitely raised eyebrows. His persistence with isolating previously free-scoring Leonardo Ulloa up top and his desire to transform our best striker in Jamie Vardy in to a makeshift winger have been thoroughly ineffective and ultimately a waste of time. It seems clear to everyone in the stands that Nigel needs to discover his best eleven and start playing to our strengths, home and away – like he said he was going to before the start of the current campaign. Of course, it’s also true that this slump is not all the manager’s fault. The current Leicester team(s) haven’t really looked like scoring in their last six matches, summed up perfectly by Chris Wood’s unthinkable miss on the South Coast. On top of that, our passing game has been erratic, rushed and panicked for weeks. Leicester’s attacking and defensive strengths seem to be depreciating simultaneously but despite it not being all down to Nigel Pearson – it’s his job to fix it. However, it’s important to remember that the sides that fought gallantly against the country’s footballing elite are all still here, they just need to be unearthed again. Maybe, it’s time to do away with what others think and go and play Leicester City’s game, and perhaps, in Football Manager terms switch the mentality from ‘contain’ back to ‘counter’ away from home– it wasn’t working too badly in August and September. I’m not having the suggestion that we aren’t good enough for this level because we are – we’ve seen it, it just needs to be reproduced again and again. But with all this being said, it’s imperative we as fans don’t lose hope and our patience with Nigel Pearson – he’ll sort it all out with time to spare, and so will the players. What exactly is British? Winston Churchill? Cups of tea? Rain? ‘British’ means anything you want it to. I had hoped that too would be the message of Channel 4’s Make Leicester British documentary which aired on Monday night – yet it wasn’t to be. From the introductory seconds, the programme started on with the anti-immigration attitude I quietly dreaded. Several clips positioned at the front of the documentary insinuated that Leicester had been conquered by settlers, that ‘British’ identity was being vanquished in the city and that Britons, white, black and Asian alike were all amalgamated in their derision of the new economic and crime scapegoats; the Eastern Europeans. It appeared that the documentary was loaded from the start, with the ostensibly biased casting including an unemployed Somalian Muslim on benefits, a Polish woman whose very slight toil with the English language was opportunistically latched upon by the sensationalist eagles at Channel 4, and of course, two sympathetic White Britons who were not once publicised in a damaging light, unlike the other six participants. The programme went on to explore how these people could co-exist together, continually emphasising Leicester’s afflicted obligation to verify that multiculturalism is a feasible reality in modern Britain. The viewer was afforded a few moments of modest redemption in which the participants from diverse cultures were able to enrich the lives of the others with their alternative lifestyle. However, those peeps in to multiculturalism at work were habitually misplace in between the near single-mindedness on division, in which the documentary was even left on the note of two women of differing religions re-entering in to an irreconcilable conflict. The researchers led the spectator to believe that Leicester is a city of tribal conflict, that citizens from every sub-culture were left fighting a silent war of acrimony on the city’s very streets. However, the real experiences of the people of Leicester generally rejected that opinion. In a small poll I ran on my social media page, 78% felt the show misrepresented the city and only 29% of Leicesterians felt there was any sort of ethnic tensions in the city whatsoever. In truth, growing up and living in Leicester is for many people a very heartening experience. It’s a city where Christmas and Diwali hold similar status in the eyes of the council and the locals alike. Growing up in the city’s suburbs, I was educated on the city’s varied population and given the opportunity to visit Gurdwaras, Hindu Temples, Churches, Synagogues and Mosques, all of which were hospitable, enlightening and crucially, integrated. Regrettably, the tone of the piece is very much indicative of the climate of xenophobia that has spread across the country. As mentioned, the documentary was profoundly dependent on migrant typecasts such as immigrants being benefit thieves when in fact research shows the contrary. Immigrants are 45% less likely to claim benefits and recent settlers have made a net contribution of £25bn to the national tax fund; £8.8bn more than they withdrew, 26% of NHS doctors are foreign-born. The programme demonstrated an impassioned row with plenty of xenophobic rhetoric was – it seems the recipe for media viewership at the minute is to villainise and segregate the ‘other’. Yes, experiences within the city will fluctuate but any difficulties are few and far between. The programme’s subservience to the far-right tabloid agenda was incredibly disheartening and particularly insulting to the wonderfully harmonious city that I call home. It is thoroughly inappropriate for Channel 4 to stir the pot of neophobia with loaded titles that intimate a city is not authentically ‘British’. ‘British’ to me means tolerance, respect, diversity and equality. In those terms, Leicester is as prototypically ‘British’ as you can get. The same cannot be said for the British media, works like Make Leicester British continue to fail and insult the British public. It always puzzles me as to what people’s issues are with immigrants. I want to close this post with what’s hopefully a sobering thought; your hometown, no matter where you live, is full of strangers. Why does it matter what ethnicity those strangers are?